Welcome to our Collection of Ancient metaphysical minerals and shamanic stones. We have been collecting and preserving our most treasured pieces for a time where they would find the souls best suited for each of these otherworldly rock of ages! Each piece has been chosen with care and in sync with the energies intended that brought each piece into our possession. There is a natural mystical force that varies in potency attached to the most hidden and unique pieces in the womb of nature safeguarded in each phase of its journey until the time is right. We have only been fourth coming with minimal of our gifts from nature, we have all kinds of crystals and shamanic stones to sacred temple stones that hold an alchemical force and power for transformation and ascension, finding your way home with the help of natures forces, the elements that work with the living consciousness resonant within these minerals and matrices, reminding and prompting us of what we have long forgotten helping us again remember now that it is needed for us to enter the kingdom of grace. 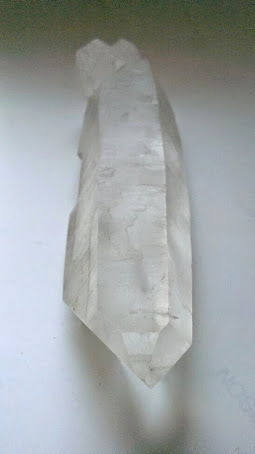 Authentic lemurian Seed crystals are no longer available from our trusted source as sources have been depleted and can no longer be found, what remains is mostly with private collectors, museums, and traders of this stone. Many souls are now being called fourth and have come to understand the significance of these crystals and what can be learnt from them. The strongest imprint and signature of the lemurian seeds are their striations, which to some observers have the appearance of being etched into the crystals, these imprints are 'codes' which contain this knowledge, interacting with lemurian seeds can trigger experiences or memories as well as opening a type of portal to ancient esoteric knowledge that would benefit the greater destiny of humanity, these were to be revealed at an important transition point in our evolution. Some ways to work with them are to hold one of the striated sides of the crystal to the third eye (between and above the other two). Lemurian Star Seed crystals are "master" crystals within the Crystal Kingdom. Within the planetary hologram they are linked to all other crystals. They transmit to these crystals the message of Oneness and Unity and Love that was the key energy of Lemuria. This is their work, to reactivate within the planetary matrix this ancient memory of Oneness and Unity so that it may become the way of life on the New Earth. These crystals are connected to inner earth, the earth's surface, and the stars, and serve as links to these various magnetic fields. 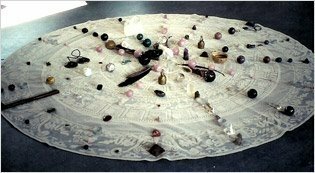 On the individual level, each seed crystal is energetically connected to all other seed crystals. 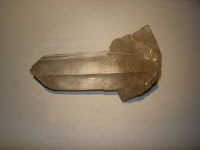 This connection is a living example of the message of the Lemurian seed crystals. They teach us how to be both individuals and integral parts of the cosmic design, that all beings are equal. They also help teach us how, as physical beings, to maintain our connection with our spiritual source. Lemuria is an ancient civilization whose center of consciousness was upon the emotional and spiritual dimensions of existence unlike our present mentally-based modern world. Their deeper connection to heart qualities allowed them to express unconditional love for the Divine and each other and enabled them to maintain a deep sense of connection to their Creator, their environment, and the whole of creation. They guide individuals consciousness toward comprehansion of Oneness and understanding of how each of us fit in to the 'whole'. 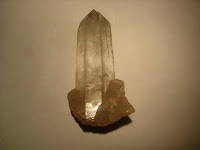 A self-healed crystal has many small terminations where it has been broken above its base and has then healed the break by laying down fresh crystals. A wounded healer-this crystal has an immpressive knowledge of self-healing, which it is happy to share. It teaches how to heal and become whole again no matter how damaged and wounded one may have been. being healed and the crystal structure being again complete. hands of the subject, or on an area of the body of the subject, in order to send to the subject the knowledge of the art of self-healing. the creativity of natural completion. on one body. The terminations on a Tantric Twin may or may not be of the same length or height but they must be born from a common base or body. Twins are also called Japanese Twins and are exact mirror images of one another. when your Soul becomes one with you Original Source, however you personally see that – as the Life Force, All That Is, the Tao, or God. mate into your life at a very high energy level. one of the best choices for two people who are already deeply united and wish to explore and strengthen that bond even further. awareness totally devoid of content, the place of Non-Being. of us know by now that this is not necessarily a pleasant experience, although it is always a productive one. yours, your Soul Mate Crystal will help you focus on connecting with a soul mate, someone that will be helpful in your life and growth at the time. Symbolizes reuniting with you other half, your soul mate. are not Soul Mates. Soul Mates are of equal or nearly equal size and length. shows up briefly and mysteriously one day. who show up with just the right words or ideas when you need them most. Aids in accessing past and parallel life information and memories.